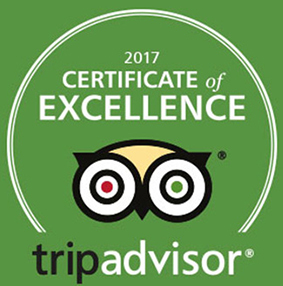 / Best Award Winning BBQ Destin FL / HUMPDAY HOCKEY & HOOPS with Award-Winning HOT WINGS Just .59¢ Ea. 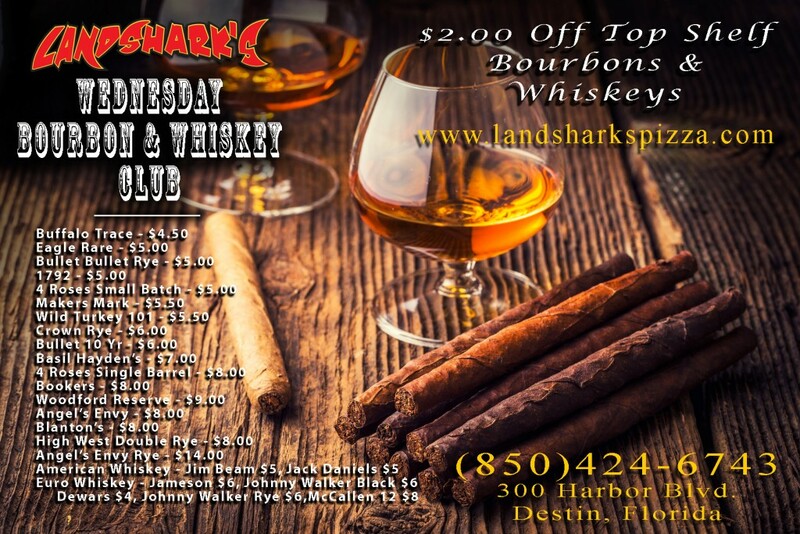 and get $2 Off TOP SHELF Bourbons! HUMPDAY HOCKEY & HOOPS with Award-Winning HOT WINGS Just .59¢ Ea. 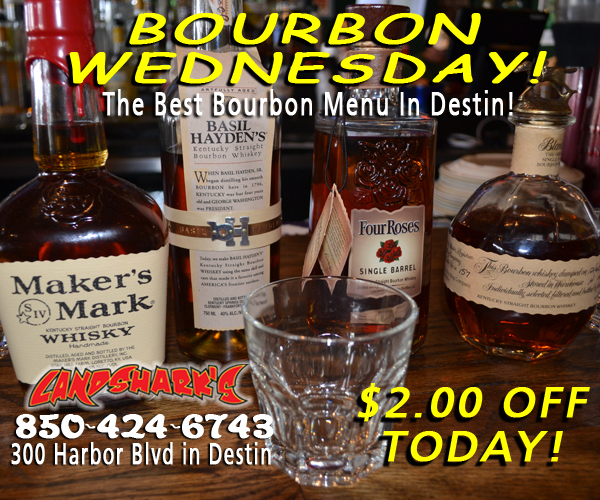 and get $2 Off TOP SHELF Bourbons! 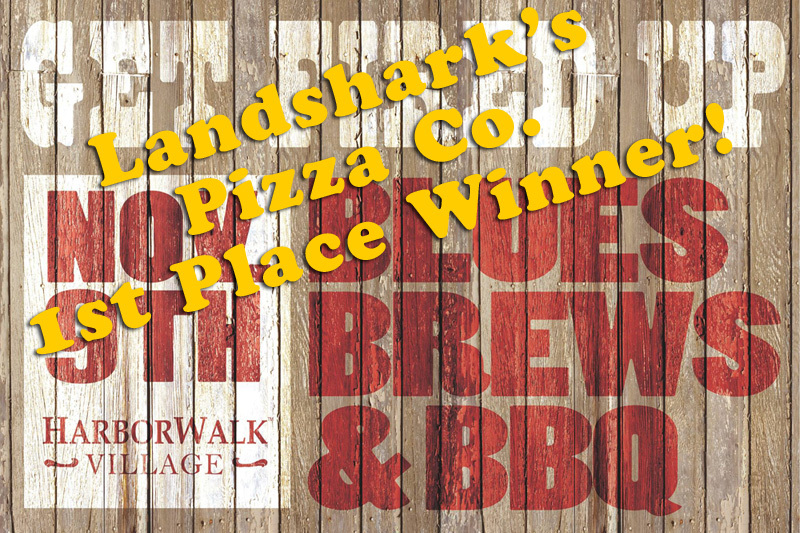 Wednesdays Are A HIGHLIGHT in Destin at Landshark’s with Delicious, crispy, juicy, & spicy to your satisfaction and only .59 Cents each ALL DAY LONG! Choose from among more than 20 sauces and rubs to compliment! 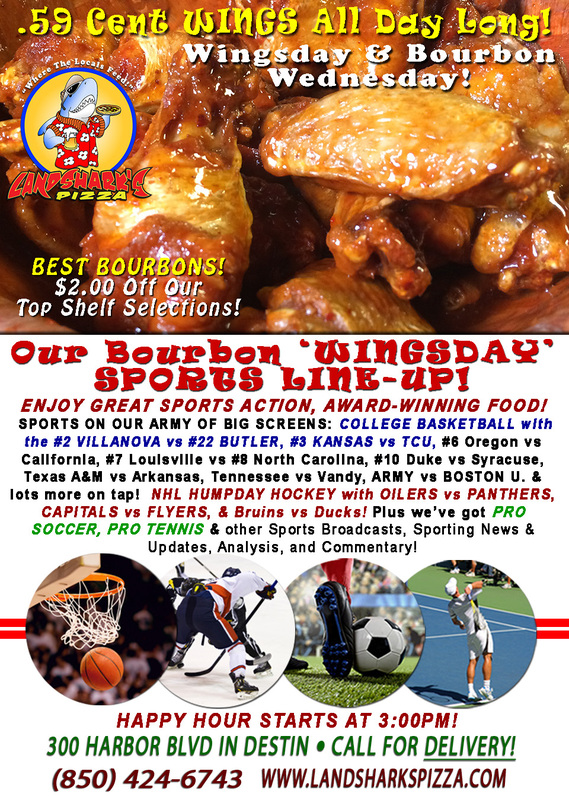 SPORTS ON OUR ARMY OF BIG SCREENS – NHL HUMPDAY HOCKEY with OILERS vs PANTHERS, CAPITALS vs FLYERS, & Bruins vs Ducks! COLLEGE BASKETBALL featuring #2 VILLANOVA vs #22 BUTLER, #3 KANSAS vs TCU, #6 Oregon vs California, #7 Louisville vs #8 North Carolina, #10 Duke vs Syracuse, Texas A&M vs Arkansas & lots more on tap! ROUND ONE PGA Tour from THE HONDA CLASSIC in Palm Beach Adam Scott defending. 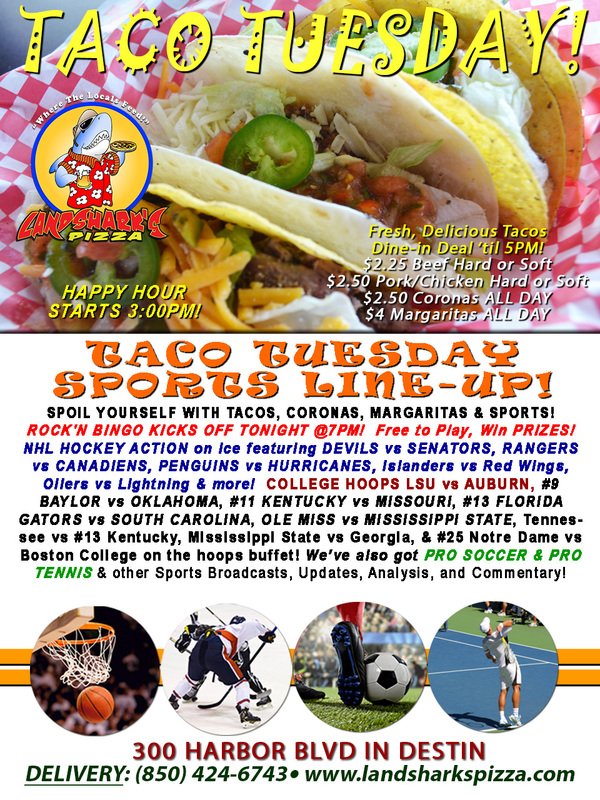 Plus PRO TENNIS, PRO SOCCER & plenty other Sports Broadcasts, Sporting News, Analysis, and Commentary! PGA Golf starts Thursday! Pro Tennis This Week: ATP Delray Beach Open (Delray Beach, FL0 & ATP Tour Open 13 action from France. NASCAR’s Coming: Daytona CAN-AM DUEL #1 & #2 Thursday Feb 23rd. Camping World Trucks Friday Feb 24th, XFINITY Saturday the 25th, & Monster Energy Cup Daytona 500 Sunday February 26th! Previous Post: « ROCK’N BINGO & TACO TUESDAY $4 MARGARITAS & $2.50 CORONAS – Hard & Soft Beef, Chicken, or Pork Tacos! 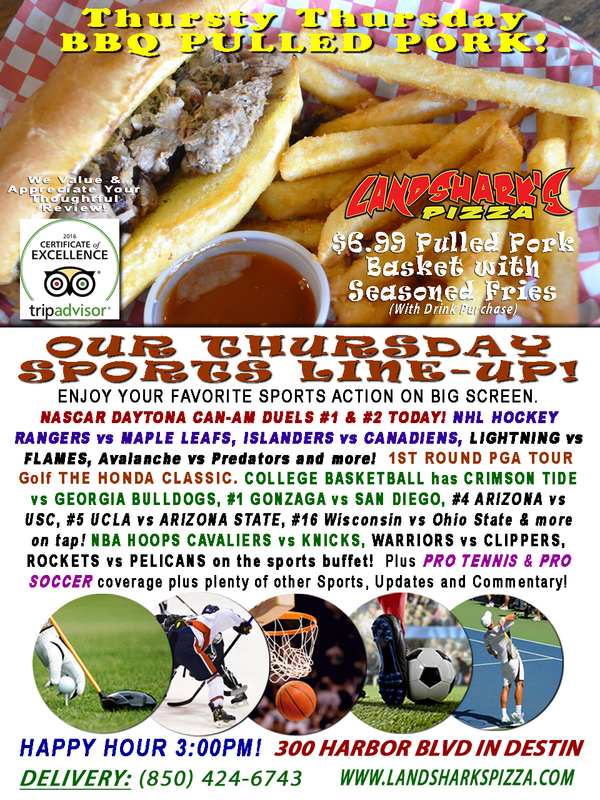 NCAA HOOPS & NHL!